Possibly the most stunning example of a Knightsmead property we have ever come across you would be forgiven for believing that you have stepped foot into the developments show home. Not only does this property have four bedrooms and three bathrooms it has also undergone a few upgrades by the current owners to make it a truly special family home. Upon entering you are greeted by a very welcoming entrance hall with stunning oak flooring and a striking oak staircase leading to the upper floors. The kitchen is fitted to a beautiful standard with integral appliances, side access and a front aspect bay window creating a lovely dining area. The lounge is located to the rear overlooking the garden with plenty space for a formal dining area and a convenient storage cupboard running under the stairs. 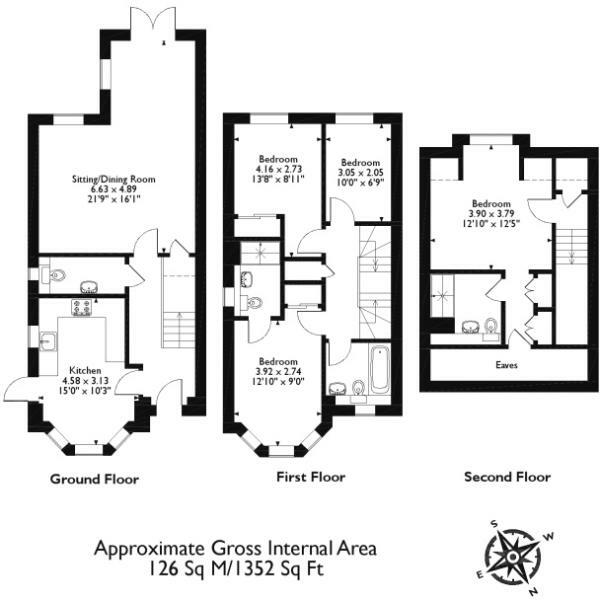 In addition we also have a large ground floor w/c. Leading up to the first floor there are three very spacious bedrooms with fitted wardrobes to the larger of the two and an en-suite shower to the guest room. Both the en-suite and family bathroom are fitted to a very high standard with high quality tiling and chrome fixtures and fittings. The entire top floor houses the master suite which is a particular feature of the property with a walk in dressing area and a stunning white three piece en-suite shower room. Further benefits to this floor include lovely views across Chertsey Town and plenty of eves storage spaces. Externally the grounds are meticulously maintained and there is a driveway allowing for parking for two vehicles. The rear garden has a fantastic patio area for entertaining and a lovely lawn for the children. With side access, double glazed windows and gas central heating we would certainly encourage and early internal inspection! Disclaimer - Property reference 18knightsmead. The information displayed about this property comprises a property advertisement. Rightmove.co.uk makes no warranty as to the accuracy or completeness of the advertisement or any linked or associated information, and Rightmove has no control over the content. This property advertisement does not constitute property particulars. The information is provided and maintained by Johnson & jones Ltd, Chertsey. Please contact the selling agent or developer directly to obtain any information which may be available under the terms of The Energy Performance of Buildings (Certificates and Inspections) (England and Wales) Regulations 2007 or the Home Report if in relation to a residential property in Scotland.